Dear chess professionals! Dear chess lovers! Let us to introduce the popular and useful chess site, our new site-friend, situated in Kerch (Ukraine). 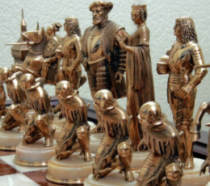 We can see the attractive information on its main page: its summary is that this site is for those who likes only to reflect on chess, and for those who likes to look for the original decision in a difficult position, and for those who likes to play at leisure with the friend, but wishes to understand playing of the partner better. And our exploration of this portal convinces us of its truth! Thus, the word “community” in site’s name tells, that site includes the high-developed chess social net (section “ Users VCCP ”) – a service, that is attractive for different kinds of visitors. Moreover, the portal contains a lot of valuable stuff: articles about famous players with their games, chess news, interviews with famous players, interesting games with grandmasters’ comments, lessons in video format (sections “Video-debuts”, “Video-lessons”), chess encyclopedia online, other articles (sections “Articles”, “Interesting about chess”, “Helpful information”, “Pages of the history”), databases of games sorted by opening (section “Debuts pgn”) and by player’s name (section “Games GMs”), games of world tournaments, composition, Nalimov tables, library (magazines, books, stuff for mobile), different rules, list of ECO codes, theoretical reviews of recent tournaments by GM Vladislav Tkachyov, lessons by GM Vitaly Kiselyov, live translations from the strongest tournaments… We can see, a lot of these materials are rare or unique! The site is divided into Russian speaking and English speaking pages, it is regularly filled by new stuff. We hope, this our article can help you to find easy your favourite places there!